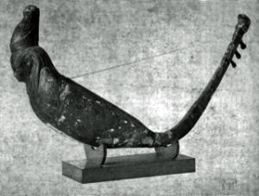 The Ancient Egyptian harps varied greatly in form, size, and the number of their strings. 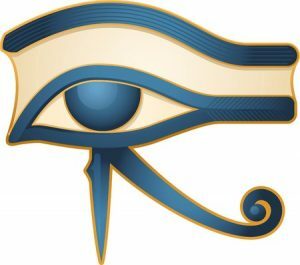 They are represented in the ancient paintings with 4, 6, 7, 8, 9, 10, 11, 12, 14, 17, 20, 21, and 22 strings. 1. 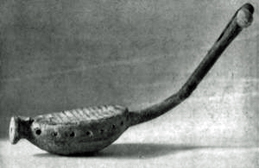 The small portable (shoulder) harp (shallow arch). Shoulder harps are found in large numbers in museums throughout the world. Like all instruments of the sort, they had a setting that could be moved from front to back and from top to bottom or vice-versa. It was a kind of suspension rod for the strings, which allowed for a quick tuning to different pitches. There is barely any difference between the bow (arch) and angular harp, as far as their sound is concerned. The numerous variety of the Ancient Egyptian harps reveals the wealth of their music-producing capabilities. The following overview is based on the ratio between open strings only. > It should be noted that many more smaller musical tones can be achieved by the one-handed playing technique, as shown earlier. 1. With harps of 4 to 22 strings, some harps would have been capable of producing a wide range of notes for several octaves. The ratio between the shortest and longest is 1:3 to 1:4 (i.e. 1 to 2 octaves). With the one-handed playing technique [see previous section], unlimited possibilities of various tones and octaves can be achieved. 2. The intervals of Fourth, Fifth, and Octave were the most common in Ancient Egyptian representations. 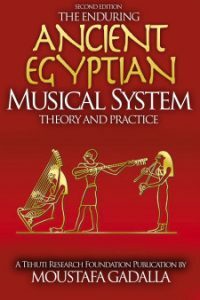 Curt Sachs [in his book, History of Musical Instruments] found that out of 17 harpists represented on Egyptian art works with sufficient realism and distinctness to be reliable records, seven are striking a Fourth chord, five a Fifth chord, and five an Octave chord. 3. 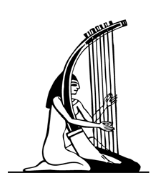 The ratio between the shortest and the longest string of several Ancient Egyptian harps is about 2:3. As this interval is divided between five strings, the scale would provide a range of tones between half and full tones. On harps with ten strings, this would give an average interval of a (minor) semitone (90 cents = 4 commas). 4. 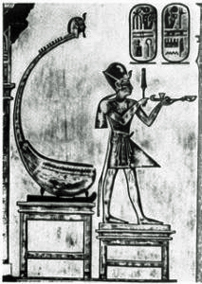 One of the two harps found in Ramses III’s tomb has 13 strings, where if the longest string represented pros-lambanomenos, or D, the remaining 12 strings would more than supply all the tones, semitones, and quarter-tones, of the diatonic, chromatic, and enharmonic genera, within the compass of an octave. 5. 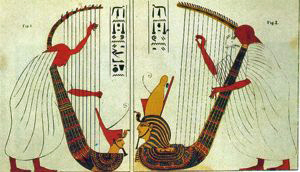 The most frequently depicted harps were found to have seven strings, and according to Curt Sachs’ study of Egyptian instruments, the Egyptians tuned their harps in the same diatonic series of intervals. 6. 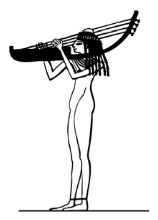 An Ancient Egyptian harp with 20 strings [found in Luxor (Thebes)], appears to have had the pentatonic scale running through four octaves. And the harp with 21 strings [in the Paris Museum] probably had the same order of intervals, with the addition of the keynote at the top.